There are simply not enough qualified commercial pilots to make urban air mobility a reality, so Bell is redesigning traditional rotorcraft flight controls from the pedals up. There are simply not enough qualified commercial pilots to make urban air mobility a reality, so Bell is redesigning traditional rotorcraft flight controls from the pedals up so more people can qualify to fly eVTOL aircraft quickly and affordably. Urban air mobility is forcing aircraft designers to flip their thought process because the pilots they were designing for were a known quantity, as each was required to have a certain amount of experience in the air and with certain controls and maneuvers. Now, for air taxis to take off in a big way, they have to be designed for mass appeal, both to pilots and the public. But there already are too few commercial rotorcraft pilots to meet demand and the barrier to entry is prohibitive for the average Uber driver, he said. To inform the future of flight controls, Bell has launched a flight control study that will survey a wide swathe of potential air taxi pilots. “We want to include them in this process as early as possible because a lot of how the average person interacts with the controls will dictate what kind of augmentation we need to do, what kind of flight-control inceptors we need to implement,” said Bell Experimental Test Pilot IV Jim Gibson. 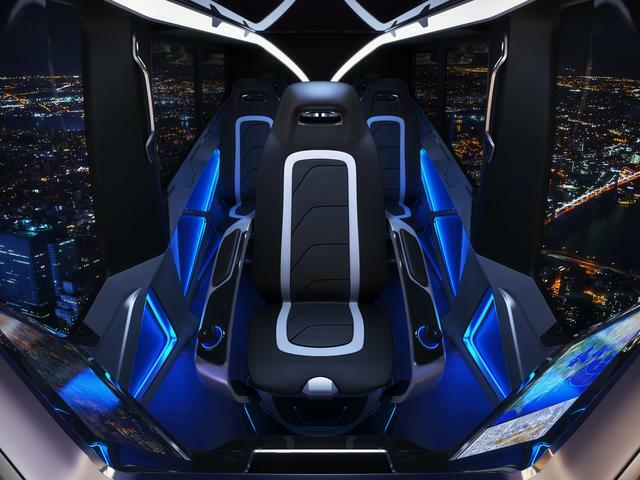 Bell entered Phase I of the study in January at the Consumer Electronics Show, where it also unveiled a full-size mockup of the Nexus hybrid/electric EVTOL design. It also began collecting data from “pilots” who flew its future flight control simulator. The same setup is available for attendees at the Bell booth at HeliExpo. Using three portable simulators that integrate virtual reality goggles with a moving, articulated seat and variations of flight controls, each participant “flies” a pre-lit route through a synthetic world. In each simulator the “pilot” tries to stay on course using first traditional helicopter pedals, cyclic and collective. In the next simulator, there are no pedals and antitorque is managed my twisting one of the manual controls. In the third, there is only one directional controller and thrust is controlled by a wheel on the handgrip. “While it might look like a high-end video game to you, it’s really collecting 350 different discreet bits of information 20 times a second throughout the time you’re operating it,” Gibson said. Each surveyed participant is given a 30-second tablet-based course on what each set of controls does, flies all three and then rates their ability to control the aircraft against the computer’s record of the pilot’s performance. They also answer a series of demographic questions to pair with each participant’s performance.